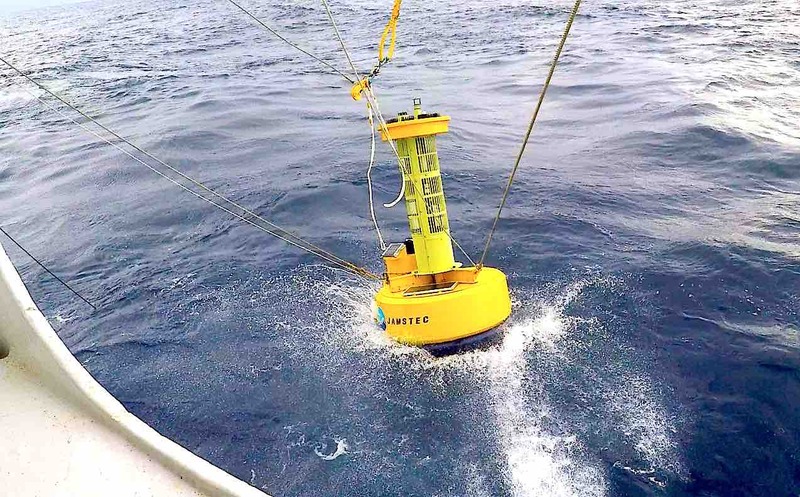 Today we deployed a new m-TRITON buoy off the coast of Sumatra (Photo), and accomplished our mission related to m-TRITON and ADCP observations in this cruise. The value of these buoy observations is proved by the reviewers’ comments on our previous reports. Enjoy the messages from the world to our data! Reviewer 1: A much needed picture of the sub-surface evolution of thermal structure and currents Reviewer 2: It is heartening to see the use of this new and exciting data set. Reviewer 2: The collection of ocean-atmosphere data during the MISMO campaign is unprecedented. It is the first time that air-sea interaction at the intraseasonal time scale has been observed in the Indian Ocean. Reviewer 1: The topic is of wide interest to oceanographers and climate scientists, the results are original. Reviewer 2: The observational results (m-TRITON) are interesting and deserve publication. Reviewer 2: The results (m-TRITON) are informative and valuable for the Indian Ocean research community. Reviewer 2: This is the first study to conduct such analyses…using direct observation (m-TRITON). Thus, this study is very valuable for the Indian Ocean climate research community. Horii, T., K. Mizuno, M. Nagura, T. Miyama, and K. Ando (2013) Reviewer 1: The data (ADCPs) are interesting. Reviewer 2: Their conclusions (southward transport observed by ADCPs) are supported by the observations.